Harley joined firm in 2013 on an Accountant Summer Internship Program before becoming full time in July 2014 as a Graduate Accountant. He studied at Bendigo La Trobe University and after 12 months as a Graduate Accountant he moved into the Financial Planning area where he is now studying his Diploma of Financial Planning. His role as a Planner is to assist the Financial Planners in their client portfolio reviews. He also facilitates share trades, helps in the preparation of financial advice documents and assists with client enquiries. 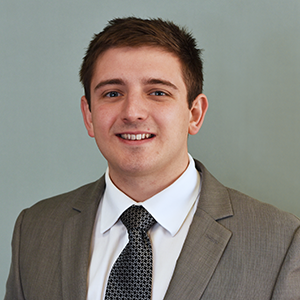 Harley is always available to help clients and says, "I provide my time and service so that the client can afford to go on a holiday or spend more time family rather than having to worry about taking care of their finances." He describes the best part about working at 360 Private Wealth as, "A great work culture amongst staff, the various aspects of expertise who are willing to help out and a fun social club." Outside of work he plays cricket for the Trentham Saints in the Castlemaine Cricket League. He also plays indoor cricket with the MGR All-Stars in the Bendigo Indoor Cricket League. He also like to read sporting autobiographies such as Ricky Ponting's and Steve Waugh's plus he visits the gym on a regular basis. He spends most weekends with friends or out walking his dogs.